2018 will see some exciting new fashion trends in footwear, with new fashions this year offering up an interesting and somewhat confusing mix of styles. On one hand, Fashion Week showed us a lot of sparkle, glitter and flash, but at the same time, functionality and comfort is not lost – and more footwear designers are bringing out new lines that combine good looks with something that actually feels good on your feet. Caitlin and Danielle are no strangers to fringe, either, and in the picture below Caitlin is wearing adorable mid-length pink fringe boots, with Danielle opting for silver, both giving a fun retro vibe that is sure to be a major trend in 2018. WORLDboots, a newer entrant to the footwear fashion scene which launched last year with a fabulous star-studded Hollywood launch party, is what happens when you put an orthotist and a fashion designer in the same room. If the meeting doesn’t come to blows, you get WORLDboots – incredibly comfortable, designed to keep your feet healthy, and they look great. 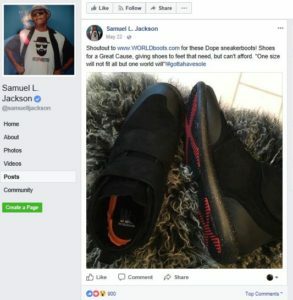 The new brand already has some pretty big names behind them, and Samuel L. Jackson called them “dope” and gave them high praise on his Twitter account. The hit YouTube show “Sneaker Shopping” is also responsible for spotting some of these same trends. In a recent episode, host Joe La Puma visited Stadium Goods in Manhattan – a temple to running shoes and street fashion if there ever was one – with pop star Kris Wu, who went a little shoe crazy in the store. 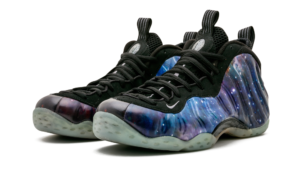 Picking up a pair of Nike Air Foamposite One Galaxies, he said, “I love the retro and throwback.” Fans of Wu will know him by his nickname – “Galaxy 5.” As he examined the shoes, Wu said, “This is crazy. Let’s bring them back! I’m going to take it home.” The retro-looking, ornate Galaxies went into Wu’s shopping bag, which by the time he was done, exceeded $6,000! The focus on high-end materials notwithstanding, the classics never go out of style, and another episode of “Sneaker Shopping” saw Ski Mask the Slump God visiting Stadium Goods, and picking up a pair of Nike Air Max 97 OG “Undefeateds” for $429. In that episode, Ski talks to host Joe La Puma as the browse the store, talking about not having the sneakers he wanted when he was growing up, and his first pair of Air Jordans. On the practical theme, some shoemakers are going a step further in 2018 with more eco-friendly manufacture and ergonomic design. Okabashi, an American-made shoe company from Buford, Georgia, is made from Microplast, which is a recyclable and durable blend of plastic. The shoes are 100 percent vegan. Footwear brands are also looking to share the wealth, with brands like WORLDboots teaming up with charities like Soles4Souls Foundation, a non-profit that creates sustainable jobs while distributing shoes and clothing throughout the world. 2018 may well turn out to be one of the most exciting years in recent history for footwear fashion. Good looks are still in – and the overwhelming theme for the coming year is the convergence of style and comfort. It will be a happy year for feet.